The bookcase by itself is a gorgeous piece of American made carpentry, but when you reveal the pull-out secret gun compartment, it adds a whole new level of cool to this bookcase/gun cabinet. With a perfectly crafted outer shell that pulls forward on smooth drawer slides to reveal a pull-out gun rack, you will never know this secret compartment exists without seeing it with your own eyes. 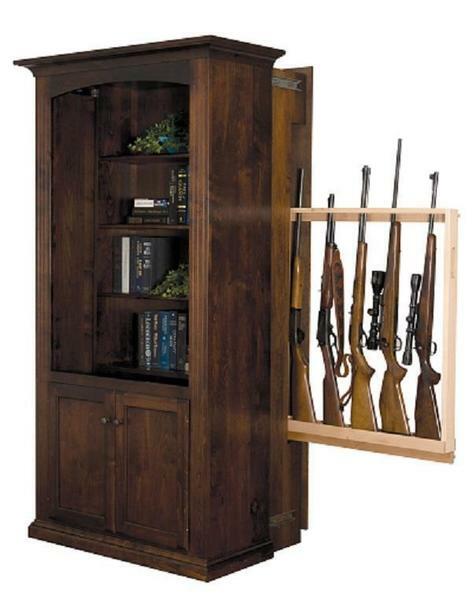 This unique design was carefully crafted as the first of it's kind to make sure there were no seems or gaps to give away the existence of the gun cabinet hiding behind these solid wood bookshelves. Quality Takes Time – Typical Build Time for This Piece is 10 to 13 weeks.